To say that Jennifer Bartlett’s pixel abstractions are rule-based and systematic wrongly implies dryness and distance, far from the truth of their warmth and immediacy. Bartlett is able to use mathematical rules to create paintings that buzz unexpectedly with humanity, in contrast to other formula followers like Sol Lewitt and Carl Andre. Emerging just after those artists in the 1970s, Bartlett took the grid—the nearly ubiquitous framework for the minimalists—in varied and sometimes contradictory directions, removing much of the dogma and orthodoxy that the form implied. Working on square metal plates, she painted images of houses, trees, and mountains, elaborate variations on repeated geometric forms, and complex matrices of colored dots, sometimes all in a single work spanning tens or even hundreds of plates. Her entirely abstract dot paintings are the subject of Chaos Theory, her current exhibition at Locks Gallery that chronicles the evolution of the dot since 1971. It takes patience to understand the making of these paintings, but it’s worth it. Prolonged attention reveals surprising, even funny interactions between formula and intuition, simplicity and (occasionally transcendent) complexity. The most recent work in the exhibition is on the second floor, comprising ten works made since 2001. To understand the historical continuum, it’s best to begin on the third floor, where a few works from the 1970s serve as a primer on Bartlett’s early development of the dot. These paintings on square steel plates show her feeling out working methods with the grid, veering towards a quirky study of the effects of frequency on color in Untitled (from Series IV) [CN 2033], 1972, then towards the aridly conceptual in Counting, 1973, the sole monochrome in the exhibition. In those and other works from the early 1970s, Bartlett developed a method of painting over a screen-printed grid, essentially turning each panel into a piece of rigid graph paper. Including the template in the painting itself affords these paintings a humble openness, even when the complexity of the patterns themselves visually dazzles. 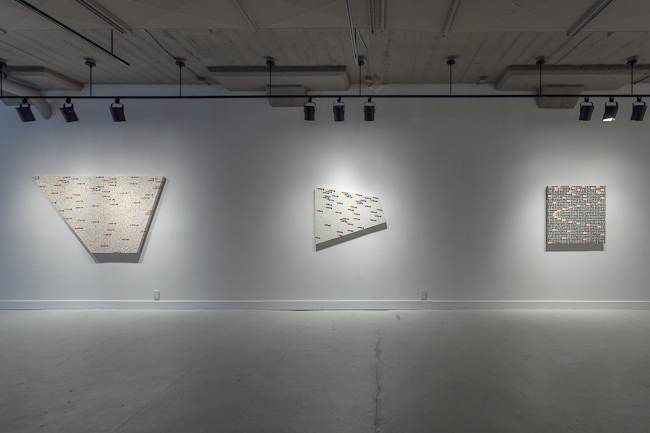 Such is the case in the most mathematically impressive work in the exhibition, Trio, 2008, painted on forty-five square plates using the same screen-printed grid method seen in works made thirty-five years earlier. 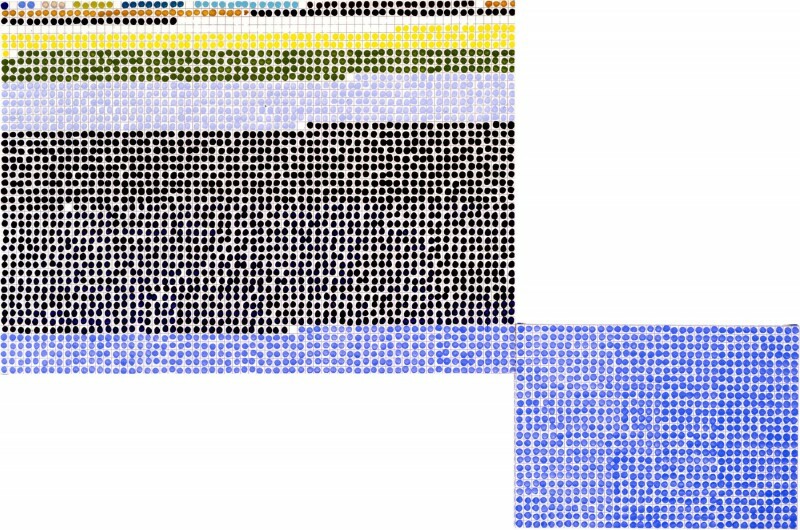 A sequence of colored dots proceeds in a fixed order in each panel, beginning in the upper left, with the number of dots in one color increasing by one with each repetition. A cycling, dizzying pattern that resembles the parabolic rings of Saturn emerges, daring the viewer to decipher the logic behind it. In adjacent paintings, we see similar patterns again—forming another series of parabolic arcs in Counting Square, then breaking down into pleasing irregularity in Counting White and Counting Polygon, each painted on a non-rectilinear, four sided canvas. That Bartlett would deliberately structure these latter two paintings to sabotage her usually exquisite pattern is telling: for every element of how-did-you-do-that complexity, there is a push towards purposeful awkwardness and material honesty. This work, after all, isn’t about chaos and complexity in the way of a computer generated fractal. It’s about the modest, handmade path towards that complexity, with many interesting tangents pursued along the way. Moving to the more recent works on the second floor of the gallery, this humbleness, entropy, and even humor are to be seen in the (mostly) more recent works. Color Study: Size, Hue, and Tint could be a straightforward set of color studies if it weren’t painted on three great big canvases: a right triangle, a U-shape, and a rectangle, sandwiched next to one another in a charmingly goofy counterpoint to the focused color meditation on each of the three. Bartlett deploys the Fibonacci sequence in a number of recent works that are too oddly proportioned and pleasingly wonky to call to mind the “God number” pseudo-profundity often associated with the pattern. In Original Fibonacci a second canvas is butted against the lower right corner of the first to accommodate a hilarious number of sky blue dots. At their best, these paintings are about the child-like glee of exponential patterns (ten, a hundred, a million, a million-billion! ), bringing levity and accessibility to otherwise dense mathematical patterning. The five most recent works are paintings of what Bartlett calls blobs rather than dots, exchanging complexity for painterly simplicity. Textured brushstrokes, drips, and wobbly lines turn the dot from base unit to subject, irregular and imperfect in its elongated version. Careful color relationships in paintings such as Untitled Blob 2 allow these blobs to recede into the background or push forward, as in the most considered of Joseph Albers’s rectangle color studies. But too much is lost in the exchange between dot and blob: patterns are essentially gone, as are the unexpected compositions that such complexity often leads to. A good case for artists following rules of their own devising is that it allows them to move beyond their own intuitively conceived boundaries and expectations. 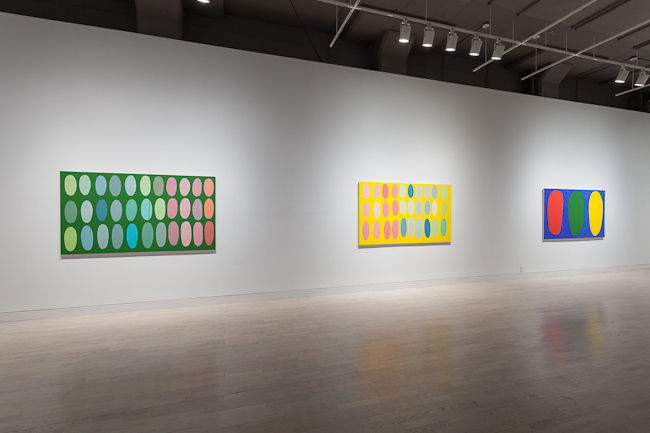 These blob paintings remain within such intuitively conceived boundaries, conventional, safe, and boring in comparison to other works in the exhibition. 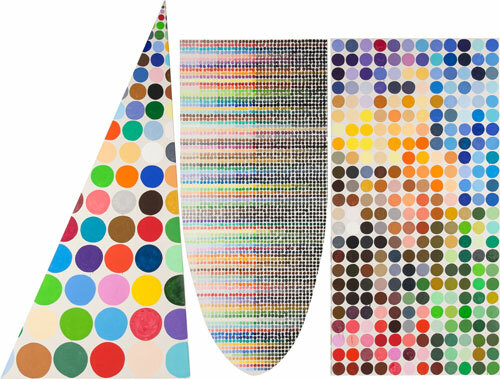 Bartlett’s dot paintings are among her most distilled and narrow. In her work broadly, much of the appeal stems from seemingly contradictory approaches used hand in hand: realism understood through abstract pattern, realism abutting abstract pattern, and many permutations in between. Perhaps the blobs in her most recent work will take on a life of their own, in combination with other approaches. Bartlett is indeed one of the few artists whose painting practice successfully encompasses such disparate working methods, sometimes separately, and often times within a single work. A second essay will focus on Bartlett’s representational paintings in Jennifer Bartlett: A History of the Universe—Works 1970-2011 at the Pennsylvania Academy of Fine Arts, June 27-Oct 13, 2013. Jacob Feige is an artist and Assistant Professor of Art at the Richard Stockton College of NJ. His work will be seen this summer in Lost & Found Part 2 at Hal Bromm Gallery, NY, and in In Front of Strangers at the Woodmere Art Museum, Philadelphia.